Key equities markets on Tuesday provisionally closed in the green to touch new 2017 highs, as healthy buying was witnessed in consumer durables, banking and oil and gas stocks. Besides, announcement of major buy back of shares by an IT major buoyed investors' sentiments. The wider 51-scrip Nifty of the National Stock Exchange (NSE) edged up by 22.75 points or 0.26 per cent to 8,901.95 points. The barometer 30-scrip sensitive index (Sensex) of the BSE, which opened at 28,716.70 points, closed at 28,761.59 points (at 3.30 p.m.) -- up 100.01 points or 0.35 per cent, from the previous close at 28,661.58 points. 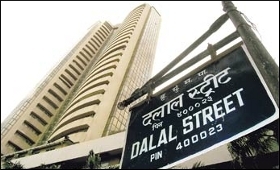 The Sensex touched a high of 28,801.00 points and a low of 28,597.33 points during the intra-day trade. The BSE market breadth was tilted in favour of the bulls -- with 1,556 advances and 1,270 declines. On Monday, the benchmark indices made gains on expectations of a share buy-back offer from a large IT major and a strong rupee. The NSE Nifty rose by 57.50 points or 0.65 per cent to close at 8,879.20 points, and the BSE Sensex was up 192.83 points or 0.68 per cent at 28,661.58 points.